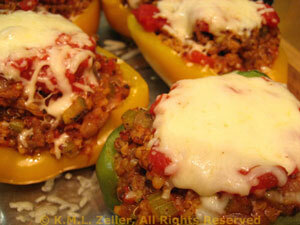 Peppers Stuffed with Quinoa, a bit of beef and lots of vegetables. I originally made these with Minute Rice, then, when I moved and could no longer get it, I switched to regular rice. Quinoa makes it so much more interesting and adds a meatier texture to the finished peppers - thus it's 'Americas Style' for both North and South! When water is boiling drop peppers in and simmer for 5 minutes. Remove (use tongs) and put into a baking dish that will just hold them (if possible). Heat oil in nonstick skillet over medium-high heat. Sauté chili powder for 1 minute. Add tomatoes, wine, Worcestershire sauce, basil, hot pepper sauce and quinoa. Remove foil and sprinkle with shredded cheese. Bake, uncovered until cheese melts. Serve. Keep any extra stuffing warm and serve on the side.